Pyramid State Park is the state’s largest state park and contains numerous small lakes with an abundant variety of fish species. It is less than an hour drive from most any community in southern Illinois. First up upon entry to the park from the south entrance is Crystal Lake to the left. This long narrow expanse of water glistens emerald green as it reflects the numerous trees along its bank in the setting sunset. The waters contain such species of common southern Illinois fish as largemouth bass, bluegill, redear sunfish and channel catfish. Using a Mepps spinner or small white Roadrunner lure, one can cast to the shallow areas along the shore near the fishing pier. Later, you can move on to the boat ramp and fished from the floating dock. Just past the dock is the site superintendent’s office. There are maps of the area and if the office is open, one can inquire as to where the fish are biting best. Moving further west, Heron Lake on the right side of the road is another long thin lake with the same species available. There is also a picnic area available and a boat ramp. Although you might not get to spend a lot of time fishing, it will be a thoroughly enjoyable way to spend time in the park. Warm spring week days it is possible to virtually have the place to yourself. Located in Perry County between Pinkneyville and Pyatts, Illinois and west of DuQuoin, the park now encompasses some 19,000 acres. Originally a local college used the area as a research facility used a strip mine, the first 924-acres. It later passed to the state in 1968 for a state park. More land additions occurred until by 2001 it reached 19,000 acres. The park consists of five units, Original Pyramid, East Conant, Galum, Captain, and Denmark. The 0riginal area contains some 30 lakes of various sizes. Captain contains 11 lakes and Denmark has 7. There are lakes in Galum and East Conant which are in need of my exploration. State stocking reports show the addition of about 100 ten inch muskie Goldeneye Lake in Galum. The stocking began in 2002 and continues to this time. In addition, to the fish mentioned earlier, Green Wing Lake, Canvasback Lake, Mallard Lake and Bluewing Lake all contain crappie with both black and white subspecies present. They range is size up to 10 inches. Canvasback Lake in the Denmark Area has received some stocking of muskies since 2002 at a rate of about 100 ten inch fish each year. Mallard and Green Wing Lakes also have walleye from yearly stockings done by the IDNR since 2002. Both Mallard and Bluewing Lakes have received stockings of Northern Pike and will get more this summer. These lakes are located in the Denmark Area. A special attraction in the Captain Area is Super Lake and some striped bass hybrids. IDNR added the hybrids in June 2003. In August of 2008, some 460 muskie joined them. On the even number years, they add some 100 more each year. The Redear sunfish are up to 9 inches in length. Muskie anglers will find some in Goldeneye Lake in the Galum Area along with some 9 inch redear sunfish. This property is basically a hunting and fishing facility. However, there are camping and hiking trails available. The roads are good and the picnic areas are clean. All of the lakes have 10 horsepower limits on boat motors and most have boat launches. Boat launch areas are often on steep inclines so 4-wheel drive vehicles are a good idea. Some of the lakes do not have launch areas and some are accessible only on foot. Canoes and kayaks make perfect sense in most of the lakes. This facility provides excellent surroundings for the angler in search of a quiet, gentle day on the water. The heavy brush deadens any sound that might otherwise disrupt ones concentration of the task at hand, fishing. Rend is the state’s second largest impoundment. It’s “Y” shape covers some 18,900-acres in Franklin and Jefferson counties. Sitting astride Interstate 57, it is approximately 6 hours from Chicago and two hours east of St. Louis. The upper forks of the lake feed the lake. They are Big Muddy River and Casey Fork River. About 47% of the adult largemouth bass in Rend Lake are over 14-inches. Fourteen inches is the minimum length for a keeper bass. Mike Hooe, District 19 Fisheries Manager for the IDNR, reports that the numbers of bass remains strong and growth rates are good. “Maintaining a steady flow of smaller fish into the population through supplemental stocking has helped to improver and stabilize the size structure of the population,” explains Hooe. 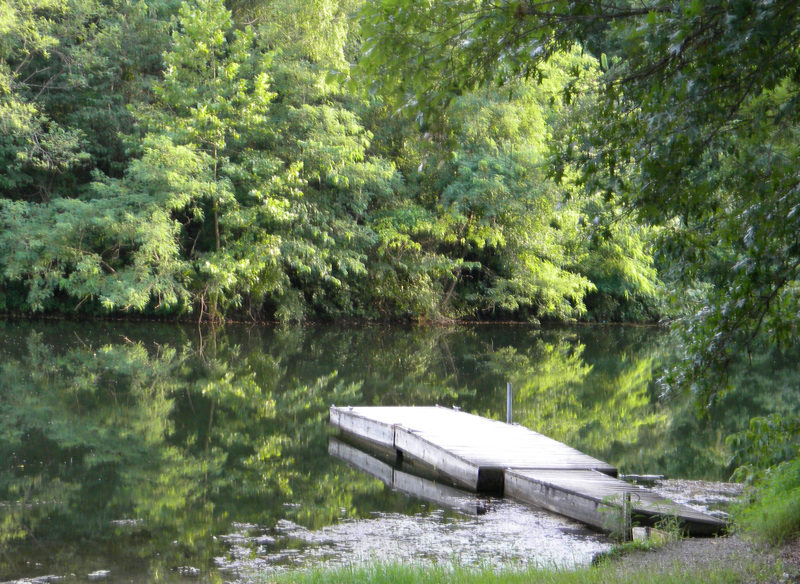 Numerous boat ramps are available on land owned by the State of Illinois and U.S. Corps of Engineers. Marina service is available on the south end near the dam at the Rend Lake Marina. On the other end of the dam are the Corps offices and a visitor’s center. North of Illinois Route 154 is the Wayne Fitzgerrell State Park containing a marina, resort, restaurants and tackle shop. All are contained in the area called Rend Lake Resort. Bladeless lures such as the Rat-L-Trap produce good catches of bass. Also productive are other crankbaits, plastic worms, and other soft plastics fished over submerged brush and shallow wooden structure. Fish shallow in the bushes with spinnerbaits or soft plastics. Do not overlook the rip rap, weed beds and drop offs. Time was when strip mined land was a story of environmental devastation. Now they have become successful habitat restoration. The woodlands, healthy grasslands and abundant water provide outdoor recreation for the public. Most of the pits available for public fishing on state land. They are in parks and forest preserves or city property. They are of the right ph to provide great habitat for fish species. The clear water makes fishing challenging. Anglers in many areas have to rely upon light line, stealth and low light to fish successfully. Boats aid in fishing some lakes but others do not accommodate such craft. Many lakes require protection from the effects of wave action. They may require kayaks, canoes, other small boats and float tubes for access. Across Illinois water-filled pits dot the landscape. State biologists manage many waters for fishing. 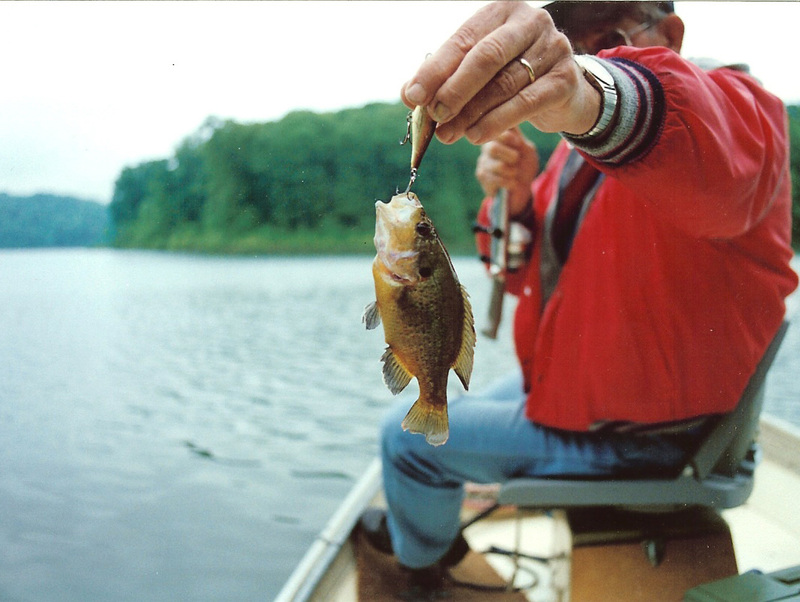 Strip mined pits produce fishing action for such species as bass, walleye, channel catfish, crappie, bluegill, sunfish, stripers, bullheads and warmouth. Some lakes contain a particular species and access may be limited as a program of management is necessary for the future. Vehicle access to many strip mined lakes is often restricted to maintained roadways and parking lots. Some roads close to all traffic all, or part of the time. Use caution when launching boats because the ramp may drop-off sharply. Many lakes have steep sides. Bank fishing anglers and those wading in the shoreline water should use caution. It is advisable to wear a PFD while near the water. Special length and creel limits provide for the future of such fisheries. Check local signage and The Illinois Fishing Digest for site specific regulations. By checking the Illinois Department of Natural Resources website, you can find the address and phone number for the IDNR Fisheries Biologist in a specific county. They are happy to give you site specific information about the fishing in their area and may guide you to a good strip pit. With the expansion of competitive crappie fishing in southeastern United States the subject of Mississippi fishing keeps coming up. Each year anglers catch huge fish in the waters of this state. The northwestern corner of Mississippi is called the Arc of Slabs due to it quality white and black crappie population. 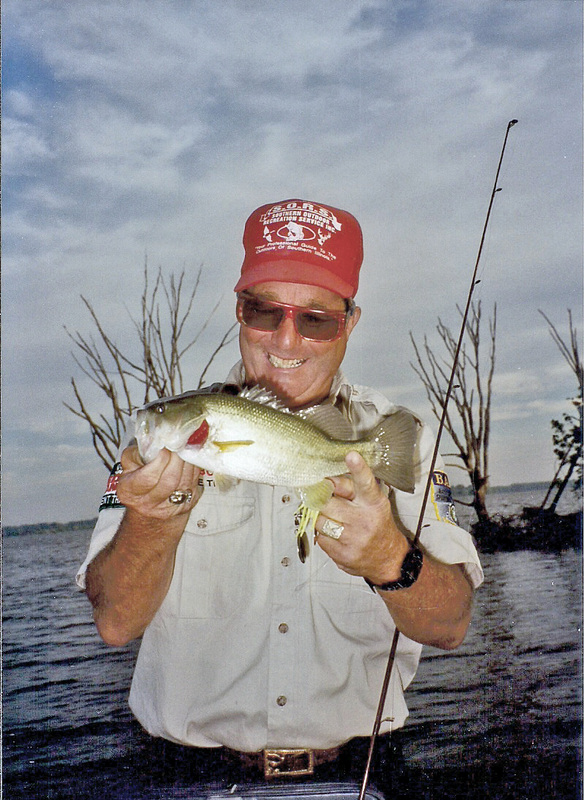 It consists of four lakes Arkabutla Lake (11,870-acres); Enid Lake (16,130-acres), Grenada Lake (35,820-acres) and Sardis Lake (32,100-acres) are famous for their crappie fishing. Along the Mississippi River are numerous oxbows, marshes and other backwaters. Unlike the northern portions of the river, here in the southern end of the river, there are no dams and floodgates to control the flow. As a result, the river floods in spring as it expands depositing soils on the shore which aids agriculture. It also floods back into the oxbows and marshes “stocking” them with fish from the main river. As the water recedes, it traps fish in these shallow waterways. The fish that follow the flow of water in search of food in the form of insects, crustaceans and other small marine animals are stuck when the water recedes. Anglers in small Jon boats, canoes and kayaks probe these waters. The smaller boats are necessary as access to these backwater situations is often off the beaten path. It becomes necessary to pull them through brush and across fields. The lighter craft are essential. The same applies to tackle. Experienced anglers use light tackle and lures. If live bait is required then small coolers with air pumps are the ticket. 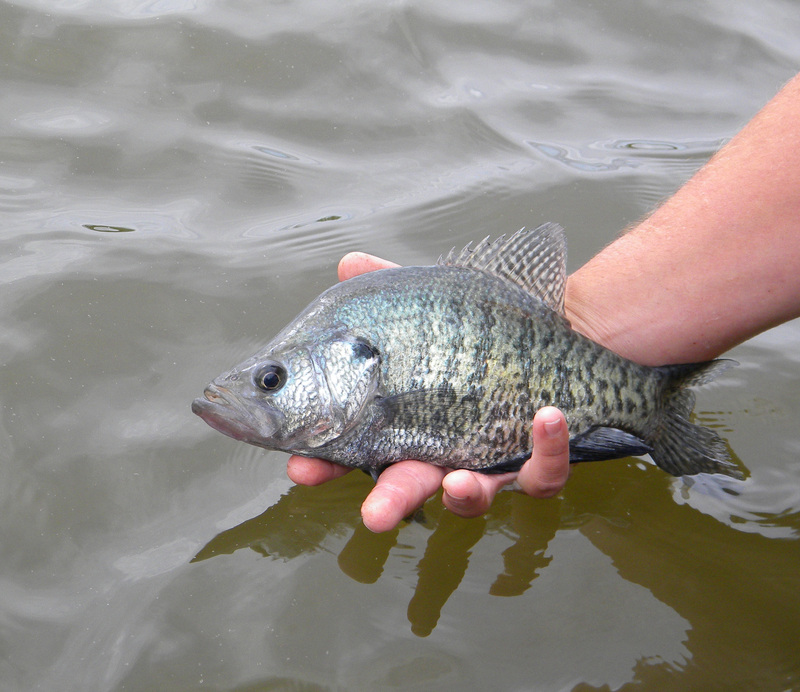 Crappie anglers prefer worms or minnows in the live bait. They use small amounts of small jigs and other lures. It is best to be selective since a few ounces saved in physical weight are helpful. First time visitors hire guides, question locals at the marinas, bait shops and local facilities in an effort to find the best locations to fish. Those anglers looking for trophy crappie seem to migrate to Mississippi. The season for Missouri trout park fishing is open. River banks are wall to wall with anglers early in the season and on holiday weekends. Then the crowds gradually disappear. But the fishing for these little torpedoes remains excellent. Classic trout fishermen typically throw very small flys. The reason they can do that is due to the fish’s is very acute vision. Certain environmental conditions call for the use of certain flys. Trout are sight feeders. Using dry flys is not the only way. Their eyes are mid-range. That means they are comfortable looking up for food as well as down. Simple is good when trout fishing. Trout have an amazing ability to consume large baits when it comes to natural ones. They are little Billy goats. They may prefer only very tiny offerings but it they are hungry they will take almost anything in the tackle box. 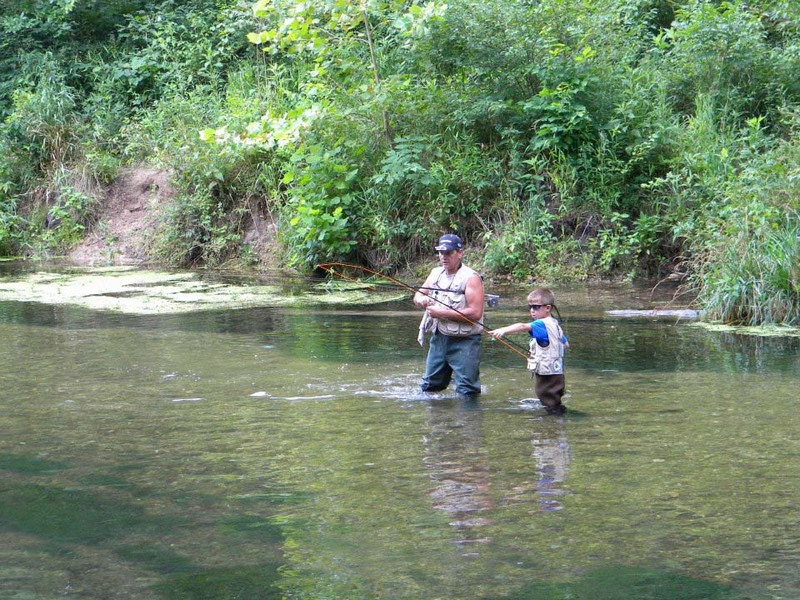 Trout prefer moving water in the 40 to 55-degree range with a rocky bottom. They survive in pond water but on a more limited basis. In rivers where water levels change during the day they survive through adaptation. In fast current they move near the edges shore. As water levels lower and current decreases they move toward the middle or anywhere. They will range most of the river system relating to structure to conserve energy and preserve calories. Trout have a lateral line like all fish. They respond to movement, vibration and sound. The lateral allows then to pinpoint a direction from which those things emanate. They move toward that sound and use their sight to zero in on it. A Trout’s tiny scales allow them to live in a moving water environment. This and their slime coat allow them to go nose into the current with less energy. They are also very slippery to handle while landing. Southeastern Missouri has rainbow and brown trout. Rainbows are the prominent stocking fish because they are the easiest trout to grow. They take to the food, they take to the overcrowding and they take any water pollution a little bit better than a brown trout. Most manmade lakes have an area where there is a little bit of a spring found when it was dug. If the fish find the area they may hang out there and feed to survive through the summer. Stocked lakes do not usually experience a trout kill. Anglers remove most of the trout. Every once in a while someone catches a whopper in a lake where they have been stocking them for a number of years. Spin tackle is the main mid-western tackle for trout fishing. Use a relatively light rod to match to your style of fishing. Light to medium-light action is best because it is very soft and very limber. You can throw very small lures with it. The reason you might like the open spinning reel for trout is that you can use lighter line. It works well with 4 to 6 pound test line. Most of the time trout are going to respond to lures of 1 1/2 inch or less. In stained water you might want to use something a little larger. You can also get away with a little bigger line of 6 to 8-pound test in camo-green. You might use the bigger line with a 2 foot leader of 4-pound monofilament. Probably the most basic type of angling in the Midwest is bank fishing for catfish. Most people have done it at one time or another and some are returning to it now. It is a peaceful and rewarding experience. Gone are daily stresses and one can catch a meal for the family. Lake Sangchris is a 2,165 acre power plant lake in Christian County, IL about 14 miles southeast of Springfield. It is a year around catfishing location. The warmer water contributes to a longer growing season. An abundance of threadfin shad probably contribute to the excellent growth that the catfish enjoy. Coupled with the warm water conditions, the small fish assist the catfish to attain nice size. Bank fishing comes in a number of areas along the 100-miles of shoreline. Cast toward islands and stumps. If hung up, the next time you just cast short of that point. On windy days, the wave action causes the mud to churn up downwind near the shore. The action stirs up crayfish and insects upon which the catfish will feed. Cast into that water. Anglers often fish for those large channel catfish after work on warm summer days. Reports are that the average size of cats is 8-to 14-pounds. Some of the larger fish can run up to 37 pounds. One must fish hard and move around a lot. Knowing where the stumps are is necessary for the larger fish. 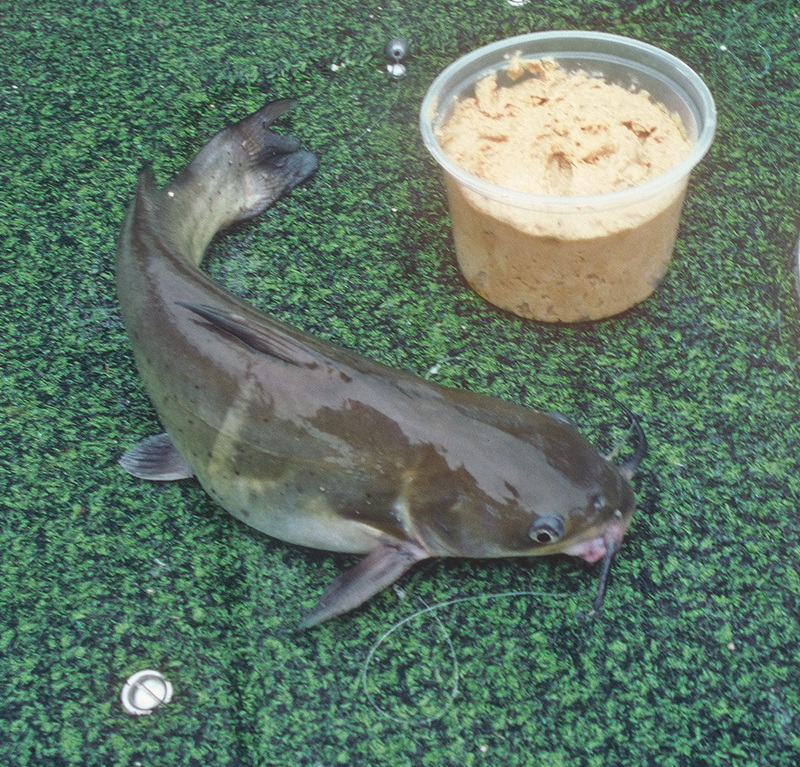 Catfish move up to shallower water in the summer to feed at night. During the day they are in the deeper water but as the evening comes on and the water cools, they move into the flats to feed. In the morning they will stay under lily pads in the shade until the water warms. Then they are back to the holes. For tackle a dip worm with a hollow core and holes to allow the bait to seep out is best for the channel catfish. Substitute a #4 hook for the #6 that usually comes with it. Check the points of the treble hooks by sliding your fingers down the worm. You should be able to feel all three hooks the same. Sometimes one of the hooks protrudes more than the others. Just adjust it with a pair of pliers. At the end of you main line, place a swivel with a one ounce sliding weight above it. A plastic bead between the swivel and the weight protects the knot where the line and swivel come together. Below the swivel attach the worm rig. The worms usually come with a leader of 18- to 22-inches, thus holding the weights that far or more above the bait. Because the worms come pre-rigged, you can disconnect the worm rig at the swivel and attach another one in minutes. This is helpful when a cat has taken the lure deep and time is required to get him unhooked. While you are working to get the hook out, the line with a new rig can be out in the water tempting another fish. Clear blue line from Berkely in the 25 pound test is a popular choice. Choose a rod that will handle at least a 2 ounce lure. The ones rated from 3/4 ounce to 3-ounces are best. The combination of the bait and sinker requires the heavier rod. For reels, I prefer spinning reels. They too must be larger and heavier to handle the long cast of a heavy bait. Generally, loosen the drag on the reel so that the lure falls quickly when released. In windy conditions tighten the reel so that the lure falls more slowly. This procedure will help to avoid birds’ nests. Cast as far out into the lake as possible, as much as 100-yards. Then check your watch for the time. Hold onto the rod securely and wait for 15 minutes. If there is no bite in that time, retrieve the bait and clean it off. After drying the worm with a towel, re-bait and cast again. Repeat the process three times. If you get no bite move to another location and begin once more. Keep trying. When first approaching an area look for shady spots where you can enjoy yourself and have an anchor for your pole. It should be open enough so that you can cast well out into the water. In still water, use a large float. The ones in the class called “cigar floats. First probe the bottom area of a hole. If the fish are not biting there, put a float on and fish in the upper water of the same hole until you find the right depth for the fish. Fish are either on the bottom or just about a foot below the surface. The secret to catfishing on Sangchris Lake is to cast, watch the clock, and move if no fish are present. Sooner or later, one will find fish. If it is your goal to finds that records class buck then look to the record books for just what areas produce them. 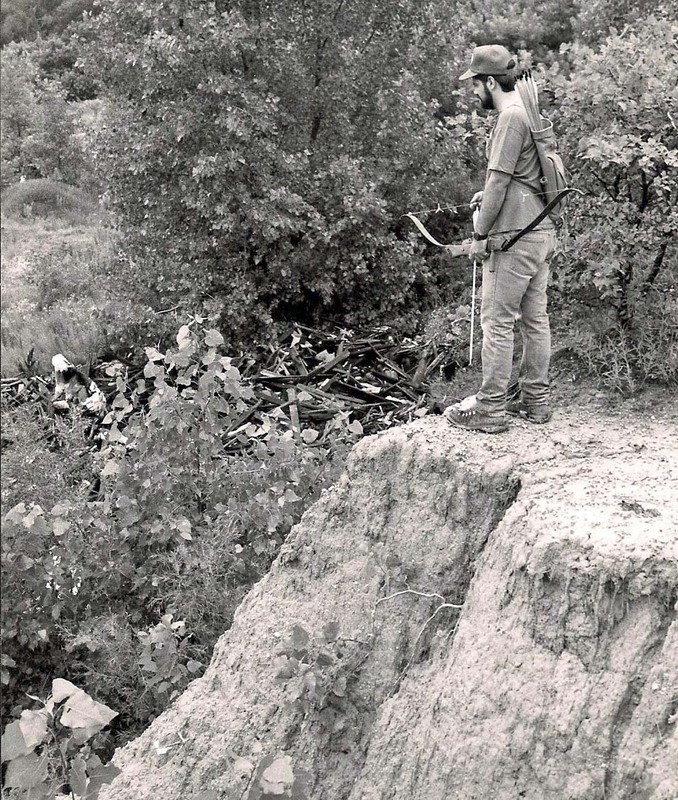 Records of big deer and press stories about hunter success are available online. Scientists tell us that there are three elements in deer growing big antlers. They are genetics, nutrition and age. You might also add isolation. Deer growing up in isolation tend to reach their genetic potential at younger age. Pressured bucks never get that chance. Not only do they die at a younger age but they also live their life under stress. Stress seems to retard natural antler growth. Study of the record books shows that if you can find a place where all these conditions exist, you stand a good chance of harvesting a great deer. Once you identify an area it is time to find a landowner there who will allow you to hunt his property. You might need to pay a trespass fee. Or do some work in exchange for gaining permission to hunt. Other land owners will allow you to hunt their property with no strings attached. But, they are getting fewer each year. Landowners are hearing that wildlife is another crop that they can harvest to help pay the bills. As agricultural profits decrease, the need for money to pay the mortgage and taxes become more of an interest to the landowner. Once you secure a good location for the hunt, it is time to go out and check the land. It is helpful to interview people who work and live in the immediate vicinity. They see those big deer in their daily activities and often can tell you where the big guys are living, feeding and traveling on a regular basis. Do not spend too much time scouting as you can cause deer to change patterns to avoid you. Just go out enough to locate a place to set up your stands and/or blinds and then stay away until hunting season. One way to find out just what deer are using the area is to use a trail camera. Deer are photographed without being aware of the process. The camera operates in complete silence using the solid state technology. It uses a memory card that digitally stores hundreds of images. You then view the stored images either in the field or downloaded to a computer at home. Scouting has arrived in the computer age. Still there is no substitute for good old hard work and study. Doing your homework prior to the beginning of hunting season greatly increases your chance of a successful hunt this fall. It also enhances the experience and expands the time spent scouting that big buck.